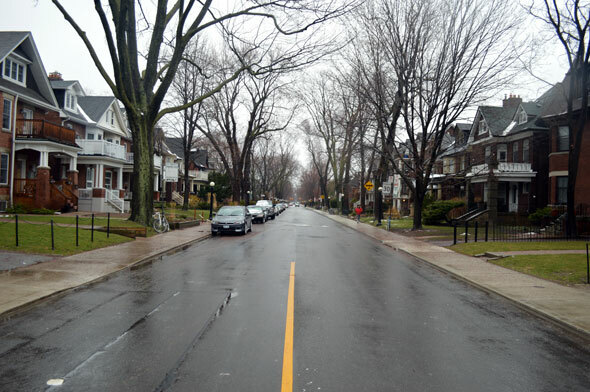 Something's different about Palmerston Boulevard. Large stone gates greet visitors entering from Bloor Street. Heading south, ornate iron street lamps line the curb. How in a city where a manual dictates everything from the look of paving stones to the width of patios is Palmerston able to be different? The answer, simply, is history. Palmerston has managed against the odds to retain its early street furniture as other streets were stripped and brought in line with the rest of the city. Palmerston's 64 unique lights date back to the early 1900s. The cast iron poles originally supported incandescent lighting fixtures, similar to the old energy-sucking bulbs found around the home, but the system has since been upgraded several times, most recently in 2004. At that time, city council was facing a steep bill to bring the lights up to electrical and brightness safety standards. Some poles were found to have chipped paint and minor structural defects, not to mention the light emitted by the Metal Halide bulbs was less than half the safe level. The wiring was in bad shape too, and a staff report said aluminum replicas might be better value for money. Though it was faced with a $245,000.00 maintenance bill every 10 years, council voted to save the Palmerston lights. The original glass globes that shielded the lightbulbs were replaced, however, with plastic alternatives that help direct light downward and are better value for money in the event of a breakage. Similar lamps also survive on Chestnut Park in Rosedale. The gates - well, gate posts - are a throwback to the street's years south of the Seaton Village development, which was once outside the city limits. At College and Bloor, the stone structures linked with iron railings suggest an entrance to a private rural street even though the boulevard has always been part of the City of Toronto. A study of Palmerston Boulevard published in 1982 says gate posts suggest an "enclave" and the "notion of an approach that ideally culminates in a villa at the end." The slight deviation from the normal street alignment at Bloor adds to this effect. As the lights and gates suggest, Palmerston Blvd. has managed to hang onto its wealth, too. Though many of the larger homes have been divided into apartments, many of the buildings retain their original grand porches. For more than 100 years, the street, named after former British prime minister Lord Palmerston, has managed to hang onto its stately air. 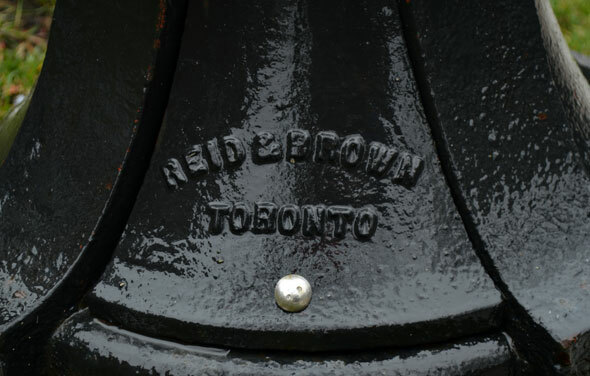 The street has been home to mayors Sam McBride and Horatio Hocken, the man who went on to found the paper that would evolve into the Toronto Star. 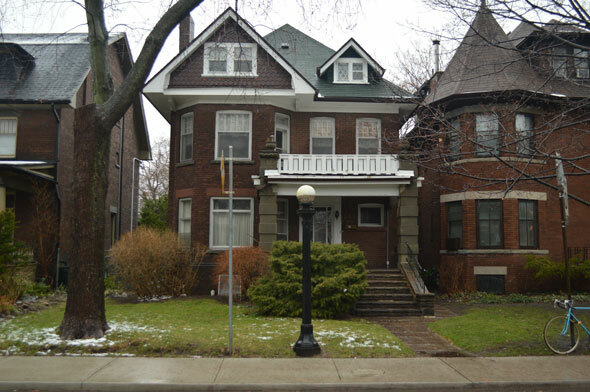 George Weston - the founder of the baking empire and former city councillor - was also a resident of Palmerston Avenue. Happily, the future of the street's unique features are secure for now. 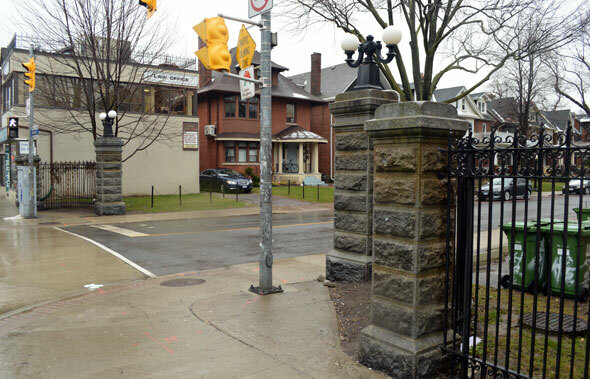 Both the lamps and gates are listed as heritage structures in Toronto.